Profits return but fail to boost real economy in many advanced countries. GENEVA (ILONEWS) – Failure to translate profits into investment in advanced economies is holding back the employment recovery, according to the ILO’s 2013 World of Work report. The report finds that advanced economies contributed just over one-third of global investment in 2012, compared to over 60 percent in 2000. At the same time, job growth remains weak in these countries and employment levels remain below pre-crisis levels. By contrast, emerging economies accounted for nearly 47 percent of global investment in 2012, compared with only 27 percent in 2000. Employment grew by roughly 7 percent on average between 2007 and 2012. Globally, investment is one percentage point below pre-crisis levels. 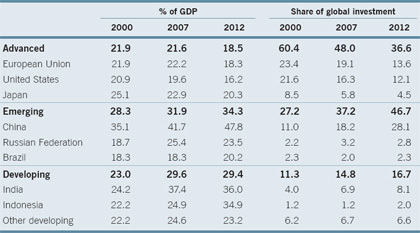 In advanced economies, investment is three percentage points below pre-crisis levels. “There is a clear relationship between investment and employment. Improving investment activity is crucial to enabling firms to take advantage of new opportunities, expand and hire new employees,” said Raymond Torres, Director of the ILO International Institute of Labour Studies. 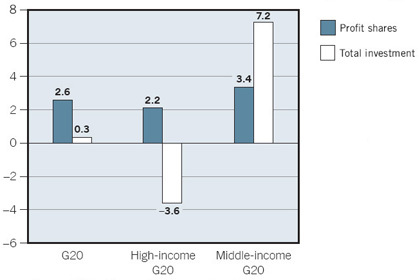 The profit share for the total economy increased by 3.4 percentage points in middle-income G20 countries, and by 2.2 percentage points in high-income G20 countries. Despite this increase, investment in high-income G20 countries decreased by 3.6 percentage points over the same period. Rising profit margins are also reflected in global stock market indices, which, in several instances, have come close to – or exceeded – historical highs. Since the trough of early 2009, global stock markets indices have doubled. At the enterprise level, the profit margins of large firms have increased since 2008 and are now at levels similar to those attained between 2004 and 2007. But rather than putting these profits to work through productive investment in the real economy, increased revenues have more often been channelled towards higher cash holdings. The cash holdings of publicly-listed enterprises in advanced, emerging and developing economies combined, increased from 2.3 trillion USD in 2000 to 5.2 trillion in 2008 and continued to rise further during the crisis, reaching 6.5 trillion USD in 2011. Smaller firms have not fared so well, with profit margins more than 40 per cent below the average attained between 2004 and 2007. “There has been a growing polarization between small and larger firms in terms of profitability, with the former continuing to face challenges. This is of particular concern as small-and-medium enterprises would normally account for significant job creation,” Torres said. Reduced access to credit, particularly for small firms, is a major barrier to investment. Reduced access to credit, particularly for small firms, is a major barrier to investment. The report finds that “financially- constrained firms are investing only half as much of their assets as unconstrained firms, adversely affecting job creation”. Many small-and-medium enterprises (SMEs) continue to report a tightening of credit standards. The report suggests that investment is being held back by lack of overall demand for goods and services, as well as reduced confidence in the economic future. Executive compensation at large firms has proven to be resilient to the crisis. In countries with available data, executive pay has returned to, and in some cases exceeded, pre-recession levels. In Germany and Hong Kong, for example, average chief executive officer (CEO) pay among the largest firms grew by more than 25 percent between 2007 and 2011. As a result, the ratio of CEO pay to average compensation in the economy grew from 155 to 190 in Germany and from 135 to nearly 150 in Hong Kong. In 2011 in the US, the CEOs of the largest firms earned on average 508 times the earnings of the average American worker. Among the largest firms examined, short-term-oriented bonuses account for more than one-third of total compensation on average – and more than two-thirds when combined with share-based compensation. The report emphasizes the need to re-focus on the real economy and calls for measures to reduce economic uncertainty and encourage investment – resulting in positive spill-over effects on aggregate demand and job creation. Improving the tax treatment of profits used for productive investment. Public investment in infrastructure, research and development and “green” projects, in order to crowd-in investments by private enterprises. This is illustrated by recent trends in several Latin American countries, China and the Republic of Korea. Improved financial regulation so that credit is available for viable projects, especially among job-rich small and medium-sized enterprises. This can take various forms, from development banks as in Brazil, to improved financial regulation of commercial banks as in Australia and Turkey, for example. Improvements to corporate governance, including the alignment of executive compensation with equity and efficiency concerns. The EU and Switzerland have announced reforms in this direction recently. The report also calls for an urgent increase in credit flows to SMEs via credit guarantees, earmarking financing and other means. ReferenceILO’s 2013 World of Work report.